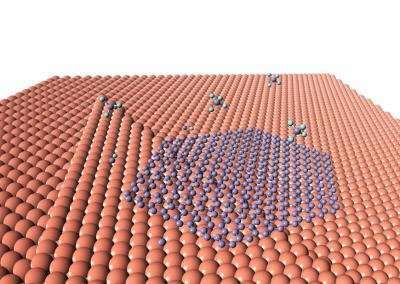 In a paper published in Nano, a team of researchers from the Laboratory of Graphene Mechanics (LogM), Zhejiang University, has shown how the morphological structure of a catalytic substrate influences the growth of graphene. This provides more guidance on the synthesis of high-quality graphene with less domain boundaries. How does the morphological structure of a catalytic substrate influence the growth of graphene? Due to the effects of other environmental parameters during the chemical vapor deposition (CVD) growth of a graphene crystal, this question remains unsolved. However, aligned hexagonal graphene single crystals provide a more straightforward way to uncover the CVD growth behavior of graphene single crystals near the Cu grain boundaries, and prove that the lattice orientation of graphene is not influenced by these grain boundaries and only determined by the Cu crystal it is nucleated on. A team of researchers from the Laboratory of Graphene Mechanics (LogM), Zhejiang University, has shown a clear irrelevance for the CVD growth of a graphene single crystal with the crystallinity of its grown substrate after it was nucleated, and proven that the lattice orientation of a graphene single crystal on Cu is only determined by the Cu grain it was nucleated on. Using ambient-pressure (AP) CVD instead of low-pressure (LP) CVD method and carefully adjusted growth parameters, hexagonal graphene single crystals up to millimeter scale and zigzag edge structures have been successfully obtained on polycrystalline Cu surfaces. Owing to such hexagonal graphene samples with lattice orientations that can be directly and simply determined by eyes or optical microscopy instead of electron microscopy, the CVD growth behavior of a graphene single crystal on the Cu grain terrace and near the grain boundaries is largely simplified, which can be further summarized with a model that solely relates to the Cu crystallographic structure. Their results showed that for a graphene single crystal grown on Cu, its lattice orientation is determined by the binding energy of its nucleus and the underlying substrate, probably by a Cu-step-attached nucleation mode, and remains unchanged during the following expansion process with continued incoming precursors. The hydrogen flow in the precursor helps terminate the edge of formed nucleus with a H-terminated structure and decoupled from the substrate surface. When the expansion of the graphene single crystal reaches the Cu grain boundary, the Cu grain boundary and the neighbor Cu grain will not change the lattice orientation and expansion direction of this graphene single crystal. The LogM is currently exploring the novel mechanical properties of two-dimensional such as including graphene and transition-metal dichalcogenides, for a better understanding of their fundamental physics and promising applications. Its main research topics includes the controlled synthesis of two-dimensional materials, the new transfer techniques with less defects and to arbitrary substrates, the experimental testing of the mechanical properties, and mechanoelectrical devices.